California and Nevada Credit Union Leagues President and CEO Diana Dykstra presents the Leagues’ Distinguished Service Award to Rob Greaff, CEO of Delta Schools Federal Credit Union in Antioch. He was honored for his work within the credit union industry and outstanding youth financial education efforts at local schools. 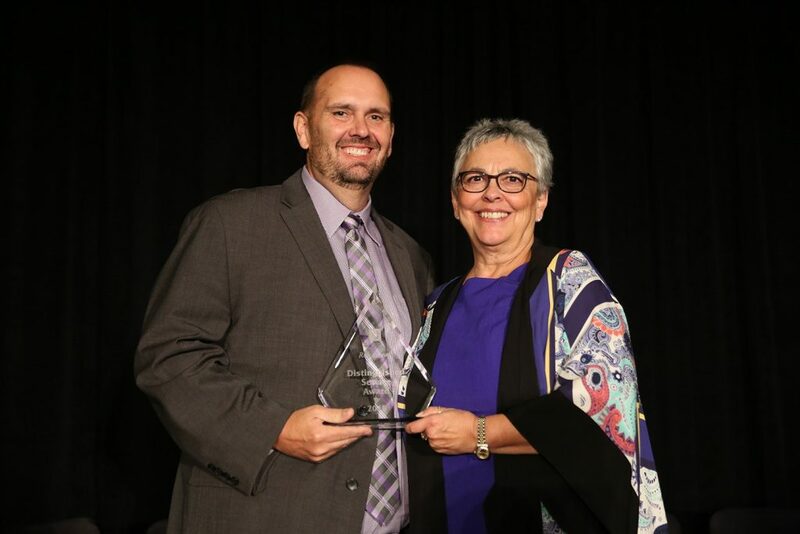 Rob Greaff, CEO of Delta Schools Federal Credit Union in Antioch, was among those honored at this year’s California and Nevada Credit Union Leagues’ REACH Conference. Greaff received the Leagues’ Distinguished Service Award, which recognizes credit union professionals’ service to the industry particularly within the last three years. He was honored during the annual meeting and convention for the Ontario, CA-based trade association for the two states, held Nov. 6-9 at the Loews Hollywood Hotel in Los Angeles, CA. Greaff was recognized for his work within the credit union industry (which spans some 25 years; 15 of those as CEO of Delta Schools FCU) as well his outstanding efforts in the arena of financial education. At the 2014 REACH Conference, Greaff attended his first “Bite of Reality”, a financial reality fair offered by the Richard Myles Johnson (RMJ) Foundation, the Ontario, CA-based foundation for credit unions in California and Nevada. The program aims to teach youth the basics of money management through a hands-on simulation. The experience inspired Greaff to create one of the most robust and successful financial literacy programs in the state. Under his leadership, Delta Schools FCU has sponsored more than 7,000 students through the “Bite of Reality” program over the past three years. In a single session, his credit union reached a record 725 students. With more than 20 sessions to date, the credit union has developed a priority to teach financial literacy to students throughout the local school district. Greaff is so passionate about “Bite of Reality” and youth financial education, that in 2015, he was asked to serve on the RMJ Foundation board. He was grateful to receive the award. “Having been nominated by a colleague and recognized by my peers, for my service to this industry that I love, makes this award an incredible honor,” he said. It happened at the Battle of the Bay, which should come as no surprise. Kayla Morris became the first NFL cheerleader to take a knee during the Star Spangled Banner, according to Business Insider. It happened during Thursday’s nationally-televised game between the 49ers and Raiders at Levi’s Stadium. The 49ers Gold Rush member is from Antioch and graduated from Deer Valley High School in 2012. 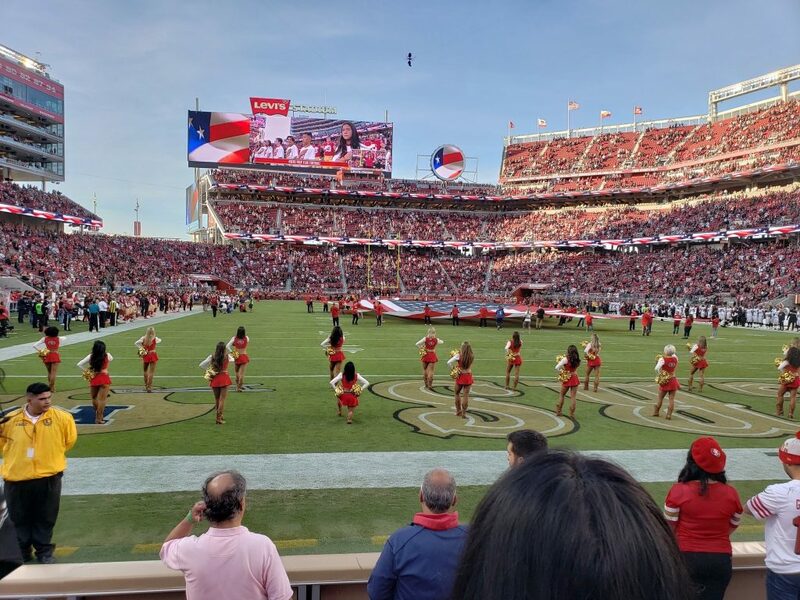 49er cheerleader kneels. Screenshot from a KTVU Fox2 News report. Her action is presumably in support of the aforementioned Kaepernick, who began protesting in effort to bring attention to racial oppression and police brutality in 2016. The 49ers have yet to comment about Morris. In the past, 49ers Owner Jed York has been supportive of players who protest. 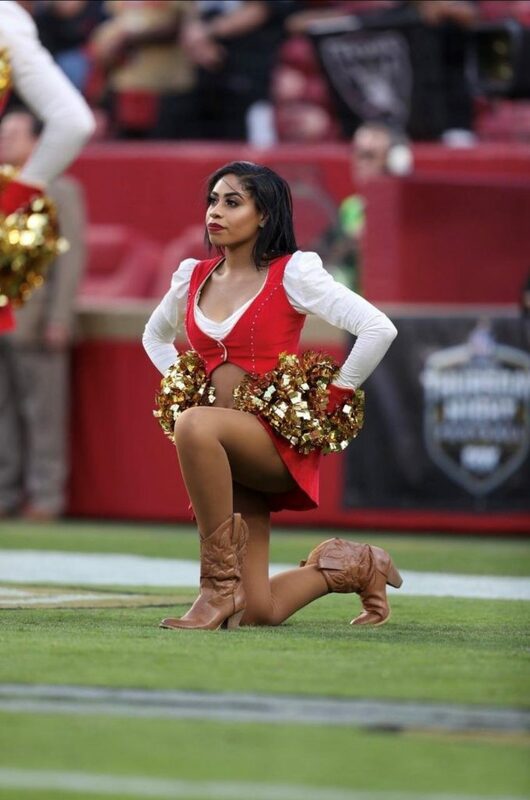 This was not the first time a 49ers cheerleader took a knee. In another photo online, former 49ers cheerleader Maria Mendez, dressed in a Santa’s Helper Christmas outfit, can be seen taking a knee before the Dec. 24, 2017 game according to a report by KTVU Fox2 News. A photo posted on the @gatorlenny Twitter feed shows Morris kneeling before the game at Levi’s Stadium, Thursday, Nov. 1, 2018. 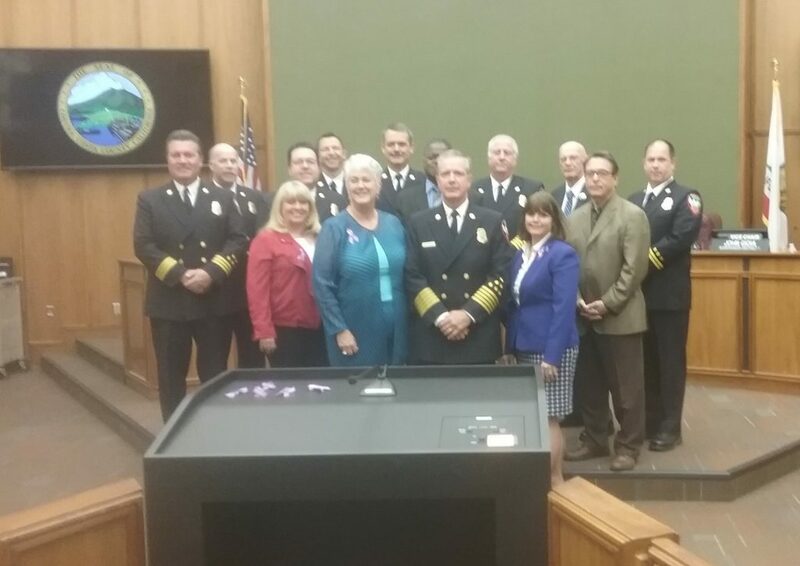 During their meeting on Tuesday, Oct. 9, the Contra Costa County Board of Supervisors honored Contra Costa County Fire Protection District Chief Jeff Carman for receiving the Ronny Jack Coleman Fire Chief of the Year Award from the California Fire Chiefs Association (CalChiefs). Carman was presented the award at the association’s annual conference in Sacramento on Friday morning, Sept. 28. 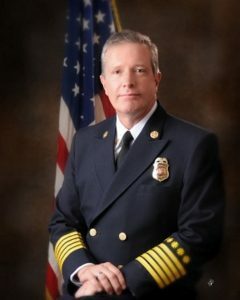 The California Fire Chiefs Association established the award in 2000 to recognize an outstanding member of the state fire service leadership community. The award recognizes a single individual who is a role model for all fire chiefs in the state as demonstrated through leadership and management locally, regionally and statewide. Carman leads a 400-member ConFire in providing fire and emergency medical response to more than 1 million people in a 304-square-mile area in Contra Costa County. During his nearly five-year tenure, the chief and his staff have reopened four stations that were closed during the recession, staffed the fire rescue boat, and improved overall fire response times. They also planned and executed implementation of the Offices of Emergency Services Type 2 Hazardous Materials Response team, and developed and expanded a joint venture with the Sheriff’s Office helicopter program for short-haul rescue and firefighting. Chief Carman and his staff were also created a unique 911 emergency ambulance system called Alliance, a private-public partnership with AMR, which supervisors credited for saving tax dollars and providing improved response times. Supervisor Karen Mitchoff said Carman has been a “strong voice on statewide mutual aid” at a critical time of large, widespread fires. “I really appreciate the leadership you have demonstrated, to bring ConFire out of a very challenging situation,” Supervisor Candace Andersen said. Contra Costa County Fire Protection District is a recognized fire service leader providing fire and emergency medical services to more than a million people across a 304 square-mile area, in and around the 20 cities of Contra Costa County, California. In 2017, the District responded to nearly 74,000 fire and EMS emergencies and provided expert medical care in the conduct of more than 75,000 ambulance transports. The District with 25 fire stations and nearly 400 employees is dedicated to the preservation of life, property and the environment. CalChiefs is a professional association whose vision is to be the voice of the California fire service covering the spectrum of fire and EMS delivery, actively engaging in legislation that affects service delivery throughout the state, including national issues. CalChiefs membership includes leaders at all levels from the more than 800 municipal fire service agencies and fire districts (paid, combination & volunteer), state and federal government agencies, and corporate fire brigades operating in the state of California and associated colleagues from fire service support organizations and vendors. Allen Payton and the Richmond Standard contributed to this report. 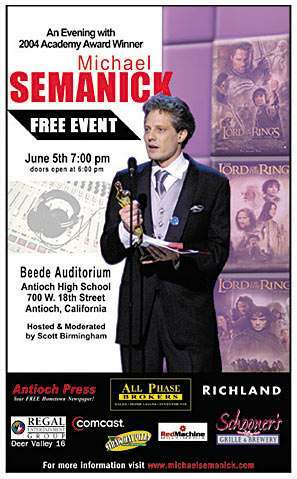 Poster from the 2004 Antioch event honoring Michael Semanick’s first Oscar win. Our classmate Michael Semanick has been nominated for his 11th Academy Award. Michael was nominated this year for his work Sound Mixing the film Star Wars: The Last Jedi. The 90th Annual Oscars are being presented tonight in Hollywood. Michael was previously nominated in the categories of Sound and/or Sound Re-Mixing for his contributions to these films and has been presented the Academy Award twice … so far. Semanick was honored with a special event in 2004, following his first Oscar win. He has worked on 110 films since 1987. After a nationwide search, the Contra Costa County Board of Supervisors chose a healthcare leader with experience in the county by appointing Anna Roth as the new director of Contra Costa Health Services (CCHS) January 30. 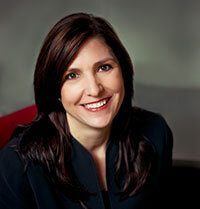 Roth has served as Chief Executive Officer of Contra Costa Regional Medical Center and Health Centers for nine years. She succeeds Dr. William B. Walker, who served more than two decades as Health Services Director and over three decades as County Health Officer. Roth holds a master’s degree from the University of California, San Francisco, and a Masters in Public Health from Harvard University. She is a registered nurse with more than 30 years of healthcare experience and is an Institute for Healthcare Improvement Quality Improvement Fellow. Roth is a renowned leader in system redesign and innovation and a strong advocate for the inclusion of patients, families and the community as full partners in the delivery of health services. “We congratulate Anna on her appointment and look forward to working with her on healthcare issues that impact our residents,” said Karen Mitchoff, Chair for the Contra Costa Board of Supervisors. In addition to Roth’s healthcare experience, she’s also held executive leadership roles locally, statewide and nationally as board member and chair of both the Essential Hospitals Institute and the California Health Care Safety Net Institute. Roth is also a lecturer at the UC Berkeley School of Public Health. CCHS is the largest department of county government in Contra Costa, with more than 4,400 employees and an annual budget of $1.8 billion. CCHS includes primary, specialty and inpatient medical care, mental health services, substance abuse treatment, public health programs, environmental health protection, hazardous materials response and inspection and emergency medical services, as well as a county operated health maintenance organization, the Contra Costa Health Plan. More information about Contra Costa Health Services is available at cchealth.org. 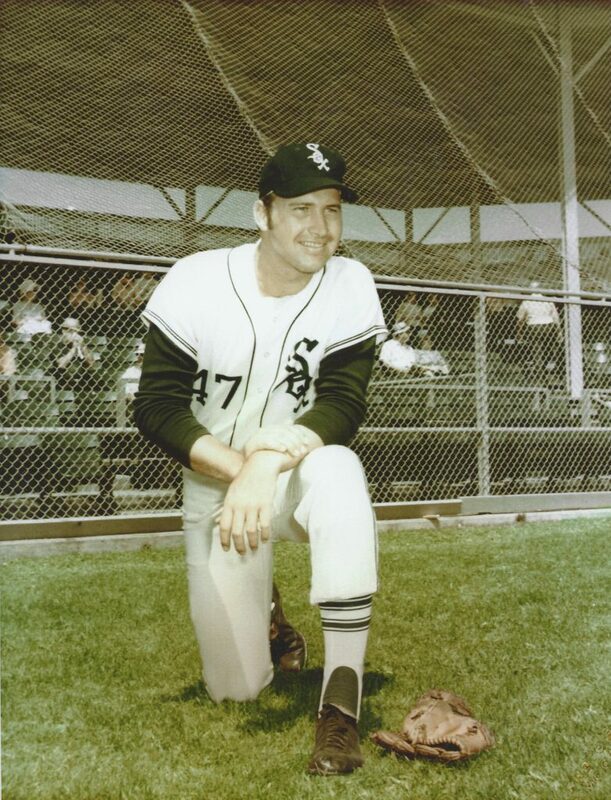 Butch Rounsaville in his playing days with the Chicago White Sox. The 2018 DVC Hall of Fame will welcome eight new enshrines. The inductees include two Antioch sports heroes, Gene “Butch” Rounsaville and Robert Hubbard. Rounsaville was the 1964 Male Athlete of the year at DVC, culminating a fabulous year where he was named first team All-Golden Gate Conference as both a quarterback in football and pitcher in baseball as well as being a starter on the Viking basketball team. After DVC, “Butch” was drafted by the Philadelphia Phillies and later went on to pitch in the major leagues with the Chicago White Sox. Rounsaville has also been honored with induction into the Reading, PA Phillies AA Baseball Hall of Fame (2006) and the Antioch Sports Legends Hall of Fame (2007). He joins fellow Antioch High graduates, Tim Foote, Baseball (2008), Steve Sanchez, Wrestling (2009) and Rally Rounsaville, Basketball (2009) as DVC Hall of Famers. Sanchez and Rally Rounsaville are also inductees of the Antioch Sports Legends Hall of Fame. Hubbard, current head football coach at Deer Valley High School, was a record setting running back while at DVC in 2002-03. In 2003 Hubbard amassed an all-time school record of 1,518 yards rushing while being named to the Mid-Empire Conference’s first team. After DVC, Hubbard accepted a scholarship to the University of Nevada at Reno and played there his two remaining collegiate seasons. Hubbard led his Deer Valley football team to the North Coast Section Playoffs this past season. Other members of this year’s class of inductees that will be honored are: Marv McKean, Coach; Sue Lindh, All-Around Female Athlete; Dr. Michael Oberlander, Team Doctor; Will Levy, Basketball; Lindsey Azevedo, Softball and Stefanie Hanf-Grinstead, Track & Field. The induction ceremonies will be held on February 22, 2018 at 6:00 PM at Diablo Valley College. For dinner ticket information contact Steve Ward at (925) 969-2762 or sward@dvc.edu. 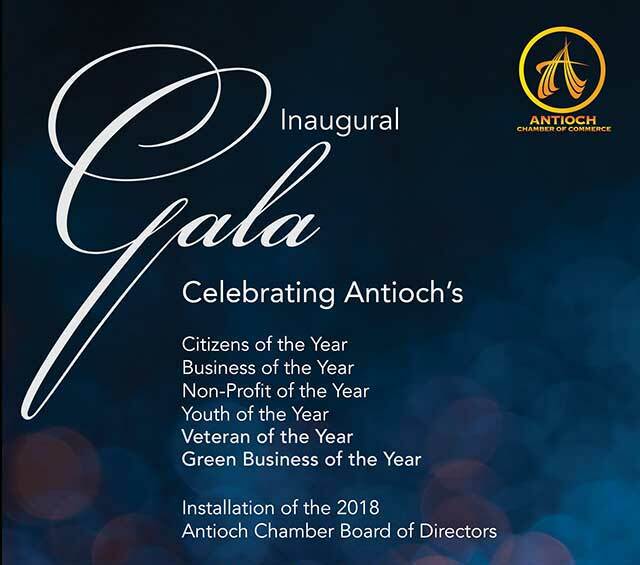 The Antioch Chamber of Commerce annually celebrates the best of Antioch for their contributions in developing the social and economic well-being of our community. Cost Per Table: $700 for a table of eight. 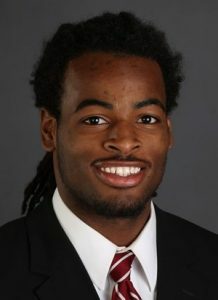 Najee Harris will become the first Antioch High School alum to play in a national championship game in college football. Harris has rushed for 306 yards, 5.6 yards per carry and three touchdowns this season, on top of six receptions for 45 yards. His longest reception came last week for 22 yards — a game in which he had no carries. 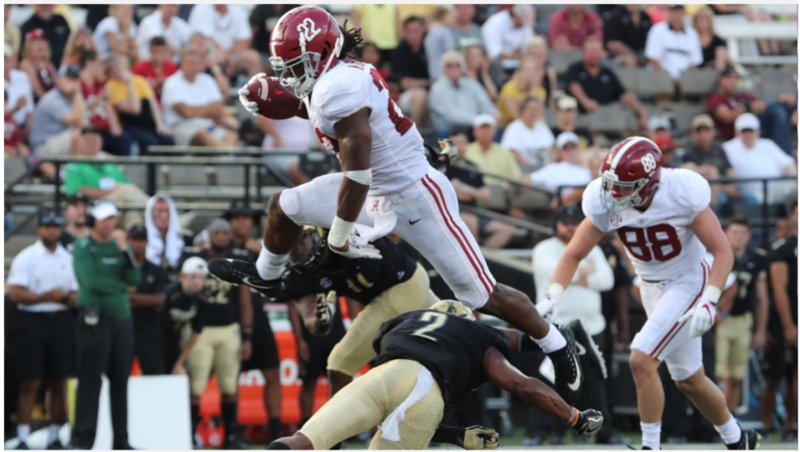 Alabama’s ground game has been led by juniors Damien Harris and Bo Scarbrough — who are potential prospects for this year’s NFL Draft. Damien Harris is projected to be picked in the second or third round while Scarbrough is expected to be selected between the third and fifth rounds, according to Senior Draft Analyst Charlie Campbell of Walter Football. 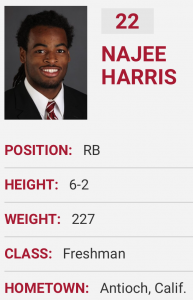 Najee Harris has been Alabama’s third option at running back with only 55 carries this season. However, Malu feels his limited action may be a good thing. Harris holds every rushing record at Antioch High School — including carries with 838. He played the majority of his senior year (291 carries) with a knee injury that he hid from the public, for which he underwent surgery last January. Malu believes this was a productive year for Harris to allow his banged-up body to recover while getting acclimated to the highest level of competition in college football. Although Malu still hopes Harris is utilized and has an excellent performance during tonight’s contest. With a lot of local anticipation for this upcoming game between two teams in the Southeastern Conference, Malu said that people come up to him at least three to four times per day to ask about Harris. “They say, ‘Hey, is the kid gon’ play? Is the kid gon’ get some touches?’ And I’m like, ‘Man, you know, you should be emailing [coach] Nick Saban,’” Malu said while chuckling. The game will air on ESPN. For more information about the NCAA National Championship football game click here.